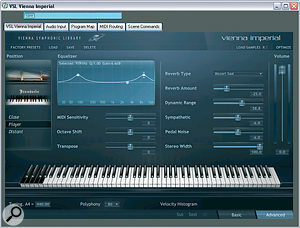 The new piano from VSL takes dynamic sampling to a new level. Could this be the ultimate sampled grand? Liberated by sample disk‑streaming, fast computers and capacious hard drives, sound companies today are free to sample instruments in unprecedented detail. In musical terms, one of the chief beneficiaries has been the notoriously difficult‑to‑sample acoustic piano. Over the last five years, manufacturers such as Best Service, Post Musical Instruments and Synthogy (makers of 'Ivory') rose to the challenge of replicating the instrument by recording samples at between eight and 16 dynamic levels in both pedal‑up and pedal‑down versions. More recently, Quantum Leap Pianos upped the ante by sampling four leading makes of piano at up to 18 dynamic levels from three mic positions, resulting in a massive 35‑DVD collection. 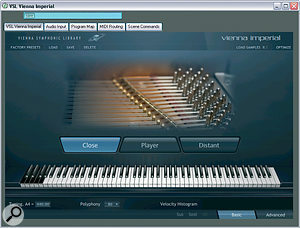 Vienna Symphonic Library first entered the sampled piano fray in 2006 with Bösendorfer Imperial (reviewed in the May 2007 issue of SOS). The piano went down well with the company's fan base, but VSL weren't content to leave it at that: their new, somewhat confusingly‑named Vienna Imperial brings you the same make and model of piano sampled at — are you sitting down? — up to 100 dynamic levels, a staggering figure which represents a 500 percent technical improvement on other sound companies' best efforts to date. Coming from a rock background where most musicians operate at only three dynamics (loud, ****ing loud and off), accurately distinguishing between 100 dynamic levels seems a tall order to me, but VSL managed to do it with a little bit of technological back‑up from the piano's makers, which I've explained below. The Bösendorfer 290‑755 Imperial grand sits in splendid isolation at VSL's Silent Stage. No player required! 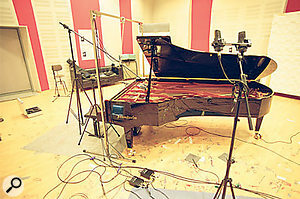 The piano chosen for this project was a nine‑foot, 97‑key Bösendorfer Imperial 290‑755. This particular instrument has a proud concert history and is in demand by pianists Paul Badura‑Skoda, Roland Batik, Paul Gulda and others. Bösendorfer (who, conveniently, are also based in Vienna) loaned it to VSL for two months, during which time it was intensively recorded in the Silent Stage, a location so free of background noise it's rumoured that if you hold your breath and concentrate hard you can actually hear your own hair growing. 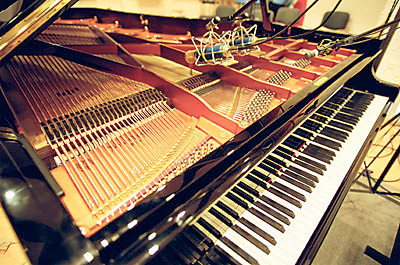 A significant difference between this concert grand and the one featured in VSL's Bösendorfer Imperial is that this piano was fitted with Bösendorfer's CEUS recording apparatus — the system uses optical sensors, microprocessors and electro‑magnetic controls to track and replicate hammer and pedal movements, enabling pianists' performances to be recorded and played back with great accuracy. It's also MIDI‑compatible, if you ever fancy hooking up a nine‑foot, £$50k‑plus grand piano to your sequencer! The CEUS mechanism accurately distinguishes and reproduces hammer‑to‑string 'arrival times' of as little as 0.001 milliseconds apart (that's roughly the time it takes the average drummer to accept the offer of a pint). Since hammer speed is commensurate with playing volume, it follows that infinitesimally small gradations of dynamic can be detected; the CEUS system can thus easily reproduce MIDI's maximum of 127 dynamic layers, something no human player could ever manage. With the help of this powerful gizmo, VSL were able to 'play' the piano via pre‑recorded MIDI sequences and sample up to 100 velocities for each of its 97 notes. As a result, it's impossible to hear any trace of dynamic 'stepping' in Vienna Imperial: dynamic transitions are 100 percent smooth for the entire dynamic range. Another barrier to perfect piano sampling bites the dust! 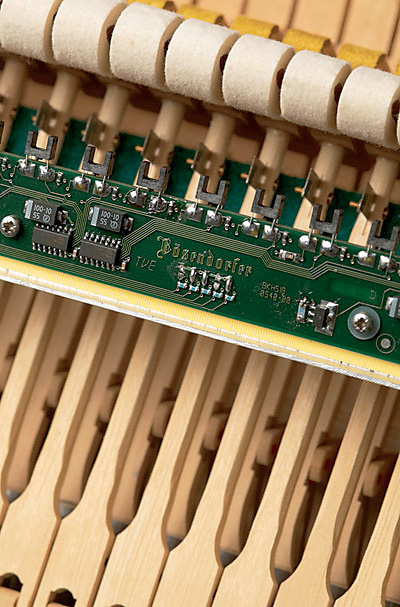 Bösendorfer pianos have a reputation for sounding rich and stately, with a thunderous bottom end extending, in some models, to sub‑sonic realms. Notes tend to 'speak' very distinctly at all dynamic levels, and I've noticed an austere, rather 'steely' quality in some models I've played (both real and sampled). While arguably an asset for competing with a full orchestra or hammering out some banging Rachmaninov solo piece, that timbral characteristic might put off players of an introspective, lyrical or jazz bent. The Vienna Imperial bucks this trend: while retaining the trademark Bösendorfer clarity of attack, it has a lyrical, singing quality and a degree of warmth I don't normally associate with the make. (I suspect this is mainly due to two factors: the way the piano is voiced, and the intimate detail of its quiet performances having been so faithfully preserved by the intensive dynamic sampling). When played alongside VSL's Bösendorfer Imperial, the difference in tone is dramatic: by comparison, the latter sounds sterner, harder and more 'classical', while the mellower tone and subtle dynamics of the new piano make it an obvious choice for lyrical and/or improvisatory solo work. However, the strong fortés and mighty, crashing, 'Leader Of The Pack' bottom end are still there when you need them and, regardless of dynamic level, the tone remains beautifully transparent across the entire eight‑octave range. Taking advantage of the precise CEUS/MIDI triggering, Vienna Imperial's release samples were timed and graded to match note lengths so that notes of different durations retain their authentic decays. Another aid to realism is the provision of 'repetition tones' (repeated notes played with the sustain pedal down), which naturally contain more 'ring' and overtones than notes that start cold. Like most companies nowadays, VSL tackle the problem of emulating the effect of the sustain pedal by recording a complete set of pedal‑up and pedal‑down samples. They also recorded 'sympathetic resonance' tones of individual strings: in theory, you can hear these in action by silently depressing a key and playing another note, thereby triggering the floaty sound of the held key's string's upper harmonics ringing in sympathy, but I couldn't get this to work. Soft pedal (una corda) samples are also supplied, accessed by MIDI CC#67 commands. In order to deal with the specialised performance algorithms of this extraordinarily large instrument, VSL designed a new player. The interface retains the familiar deep blue livery of the company's orchestra‑oriented Vienna Instrument, but that's the only similarity — there are no patch‑switching facilities or matrices, and no opportunity to layer sounds. Basically, you choose one of 11 factory presets, after which you can tweak the sound in various ways and re‑save the result as a custom preset. The adjustable parameters include a vital MIDI Sensitivity control that enables you to scale the dynamic response to your touch. A Dynamic Range setting allows the piano's dynamics to be compressed, which would be useful when using it in a track alongside bass and drums. The amount of pedal noise (the bugbear of many a recording session, but part of a real piano's sound nevertheless) can be varied, as can the degree of sympathetic string resonance. On a more studio‑oriented note, there's a cool three‑band graphic EQ with adjustable frequency and 'Q' settings. Packing up to 1200 samples per key, this is a RAM‑hungry instrument which can run your system into the ground. With that in mind, VSL include the option of reducing its size by not loading the release and soft pedal samples. Another very useful aid to memory conservation is that after you've finished programming the piano part you can use the 'optimise' function to clear out all unused samples. 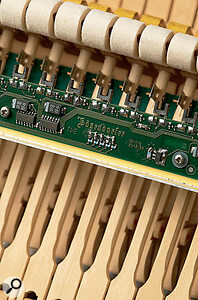 Close‑up of Bösendorfer's patent CEUS piano recording mechanism. Following the example of its competitors, the piano has a choice of three mic positions: close (microphones under the lid), middle (player's perspective) and distant (audience perspective, approximately 3.5 metres away). Since I'm used to hearing the piano from my vantage point on the piano seat (unfortunately, playing it while seated in the audience places too much strain on my arms), I assumed the player position would appeal to me most, but in fact I preferred the close miking; it's the most distinct and intimate‑sounding of the three, with the widest stereo image. Classical buffs may prefer the distant miking, though its reflections are those of a studio room rather than a concert hall. If you want that particular sound, an excellent built‑in convolution reverb, featuring a choice of three halls in the Vienna Konzerthaus, adds a lustrous ambience. VSL advise against mixing two microphone positions within the same piece, warning that: "the samples of each position are already a mix of several miking positions, and mixing them with each other might lead to phasing problems”. Presumably for that reason, the interface permits only one mic position to be heard at a time. Vienna Imperial's 'Advanced' screen showing user settings and three‑band graphic EQ section. 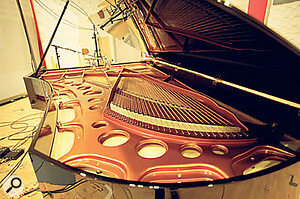 Bösendorfer refer to their 290 Imperial grand piano as "the commanding flagship — the DNA carrier”. Whether that means we'll see it floating around with cannons blazing in a TV war‑at‑sea documentary or making a guest appearance on Crime Scene any time soon I don't know, but it's certainly a very fine instrument that lives up to its hype. Thanks to that and VSL's meticulous sampling job, this is probably the best all‑round sampled piano I've heard (though I admit to not having played them all), and though its strength is classical repertoire, it will sound good in any setting, from jazz, pop and rock to orchestral. 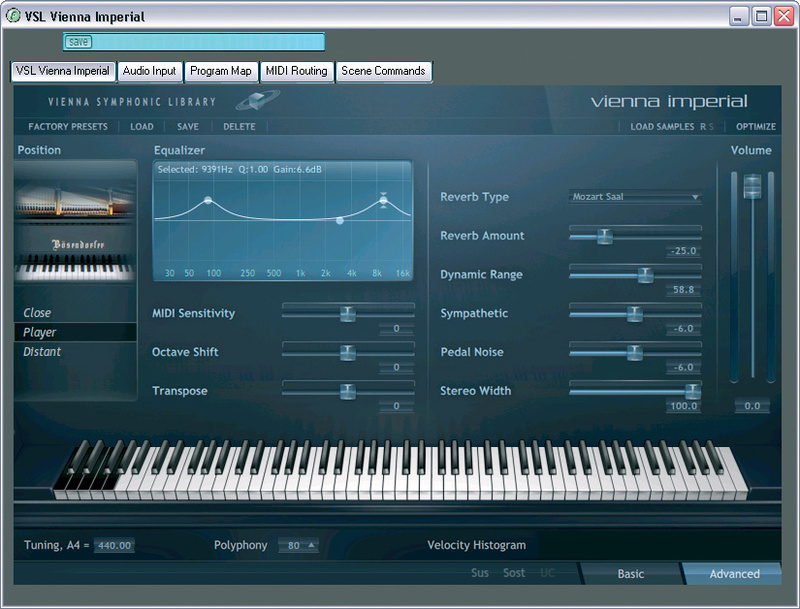 To conclude, I can wholeheartedly recommend Vienna Imperial to anyone who needs a top-quality sampled grand, with the following minor caveats: first, despite its impressive technical advantages it's essentially a digital piano, and as such can never replace the real thing. Second, piano timbre is a highly personal choice that depends on musical style and individual touch, so check out the on-line demos before you buy. Finally, make sure your system is up to it! There are more sampled pianos than you can shake a stick at. If you particularly want a Bösendorfer 290, the top quality QL Pianos four‑piano bundle contains one, as do Synthogy's Ivory and Best Service's Galaxy 2 collections. For those with shallower pockets and fewer technical demands, Post Musical Instruments' 'Emperor' Bösendorfer 290 (sound library available in various formats) remains a decent sampled piano. Though all are a good deal less expensive than Vienna Imperial, none can match its 100 dynamic levels. Vienna Imperial runs as a VST, AU or RTAS plug‑in or as a stand-alone instrument. It requires a PC or Mac with an Intel Core Duo (or AMD 3GHz for PC) processor. Supported operating systems are Mac OS 10.5 (or higher) and Windows XP and Vista. Three GB of RAM with 1.5GB free memory is also required. I tested v1.0.0.424 in Logic 8 on a 3GHz quad‑core Mac Pro with 4GB of RAM, running OS 10.4.11, and it ran efficiently with no drop‑outs, glitching or significant latency; however, secondary testing of the stand‑alone version on an out‑of‑spec 2GHz PC with 2GB of RAM produced unacceptable latency and many drop‑outs. 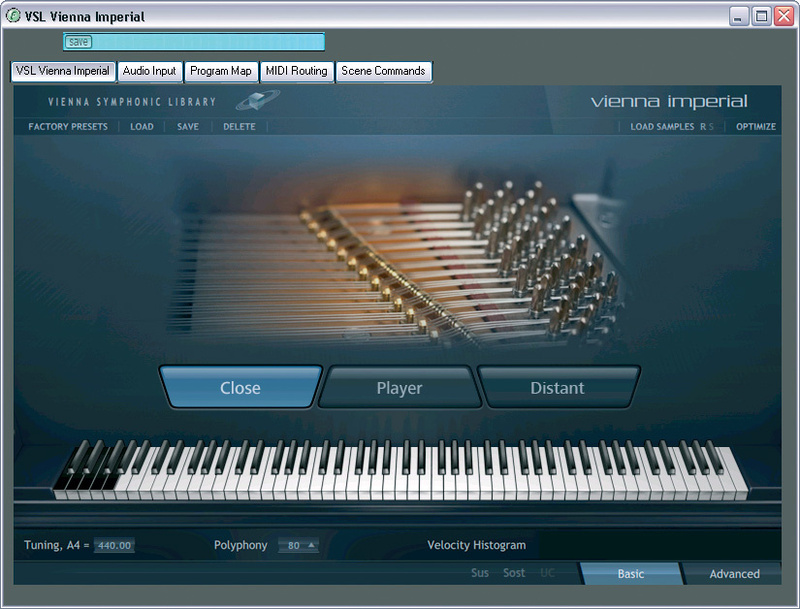 As with all VSL software products, the piano requires a hardware Vienna key that must be purchased separately and costs £26$39. Installation of the sample data is preceded by the usual tiresome rigmarole of on‑line authorisation and license downloading, which worked first time for me but has been known to cause problems. The player software is provided free; installing it and the samples from six DVDs was not overly time‑consuming — mercifully, the raw sample data (around 500GB) has been compressed down to 47GB on the discs, sparing your easily‑bored reviewer many hours of grumpy installation time. The provision of up to 100 dynamic levels per note ensures an utterly smooth dynamic response. Samples a superior, well‑voiced grand used by top concert pianists. Recorded, sampled and programmed to the highest professional level. Includes very nice, natural‑sounding concert-hall reverbs. Requires at least 3GB of RAM and a minimum 3GHz processor. An astonishing amount of labour went into creating this superb sampled grand. It plays, feels and sounds as real as a sampled piano can and its classy tone and super‑sensitive dynamics will adapt to all music styles. Happy playing! ILIO Entertainments +1 800 747 4546.